Ah, the holidays—chestnuts roasting on an open fire, Jack Frost nipping at your nose, and Valve enticing you to buy games for 50 to 70 percent off (and sometimes more!) during the 2017 Steam Winter Sale. It’s the most wonderful time of the year. Okay, enough caroling references. 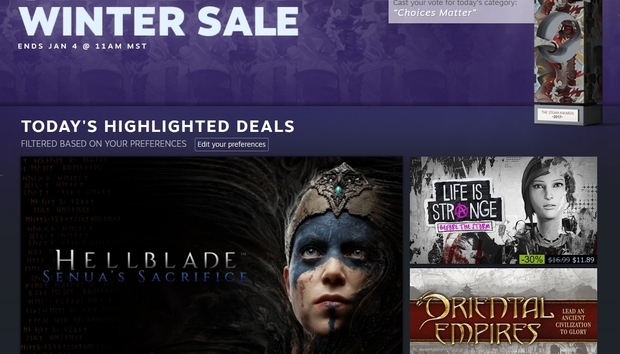 The 2017 Steam Winter Sale indeed went live this morning. Not much surprise there—Valve announced the Steam Award nominees on Wednesday and said voting would open the following day, and most people (rightly) assumed the sale would go live simultaneously. You can find a full list of the Steam Award nominees here, and it’s also tied into this year’s Badge gimmick. You’ll earn a badge for voting on each category, one category per day. Suffice it to say most people are here for the cheap games though, and the Winter Sale’s got some good ones. Some highlights from the front page: Elite Dangerous is 75 percent off, Prey and Tekken 7 and Inside and Tilt Brush are all 50 percent off, and Portal 2 is a whopping 90 percent off. No excuses for not playing that one, now. Deals are set to last until the morning of January 4, and don’t forget that sale prices are set in stone nowadays—no Flash Deals, Daily Deals, or any of the old surprises. Whatever it’s listed at now, that’s what it’ll be listed at on the final day too. Here’s the place where I lament how “Steam Sales were better in the old days,” but as always it’s still a damn fun time if you’re a PC gaming newcomer (or someone returning after a long break).